alaTest ha raccolto ed analizzato 20 recensioni su YAMAHA RX-A1070, AV-Receiver, Phono-Eingang, Schwarz. La media della valutazione per questo prodotto è 5.0/5, confrontata con la media della valutazione di 4.7/5 per altri prodotti. Abbiamo analizzato differenti valutazioni di esperti ed utenti, età del prodotto ed altri elementi. A confronto con altri prodotti, YAMAHA RX-A1070, AV-Receiver, Phono-Eingang, Schwarz ha ottenuto un alaScore™ complessivo di 89/100 = qualità Molto buono. Dont let the controller put you off. Made my existing kef speakers sound so much better! Use the smart phone app for the controller to get full functionality. No need to use the supplied controller. Sounds great and has just what I wanted. 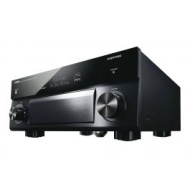 Excellent Yamaha receiver looks good and would recommend it. Surround sound is awesome but music...WOW! Even my wife said that her music has never sounded better. Bought this 3 weeks ago,solid built,tried 4K movies wow,excellent with virgin media v6 TiVo and my Ps 4.A great partner for my B&W m1 speakers and PV2D sub woofer.